In the spring of 2014 the country of Iraq started falling apart. Extremist Sunni militant groups liberated western and northern areas of Iraq from the central government. In June 2014 these groups took the second largest city of Iraq - Mosul in the north. The Iraqi army seemed to disintegrate in the face of smaller, less equipped forces. It was only when these Sunni militant groups threatened Samara and Baghdad that the government forces seemed to hold. There has always been tension and conflict between the Shia and Sunni populations of Iraq. Saddam Hussein kept a lid on it through his rule of terror; ensuring the Sunni minority enjoyed a privileged status in Iraq. But with the U.S. invasion in March of 2003 the fortunes of the Sunnis was reversed. This reversal was institutionalized with the infamous banning of Baath Party members from participating in the new Iraqi government, civil administration, and the dissolving of the Iraqi Army (Jerry Bremer hard at work here). The Nouri al-Maliki government, supported by the U.S. administration, ensured that the Sunnis would remain disenfranchised. It was a matter of time before the Sunni tribes, former Baath Party members, and hard-line former military leaders would join up with Sunni militant extremists to carve out a Sunni enclave in parts of Iraq. Miscalculation of the United States. In its haste to defeat the Islamic State (IS) the United States may be ignoring the roots of the problem. The Islamic State may succeed in establishing an independent Sunni area (parts of Syria and Iraq) if the reasons for the Sunni revolt are not addressed. There is a reason that the Islamic State is successful; it has the support of the majority of the Sunni population. If the international community makes progress in addressing the grievances of the Sunnis then the IS will eventually lose its support. Defeating the Islamic State will have more to do with political progress and reform in Baghdad than tactical military gains on the battlefield. This insurgent group is a brutal Sunni militant group that has steadily grown over the years. It has been involved in the fight against Syria's Assad regime as well as against moderate Syrian rebels. The goal of ISIL (or ISIS) is to establish an Islamic caliphate spanning the Middle East region. What's In a Name? ISIL is also called ISIS for Islamic State of Iraq and Syria and the Islamic State. 39. This is confusing because the word Syria in earlier times stood for Syria, Lebanon and other adjoining areas of the Middle East. Another name in use is the Islamic State of Iraq and al-Sham (ISIS). ISIS tends to be used by the American media; others use the Islamic State. However, the true translation probably is ISIL with the L standing for the Levant; although the term Levant has colonial connotations. The Levant is not just Syria; but also some areas of Jordan, Lebanon, Palestine, southern Turkey, and Israel. 32. So, the name of ISIL could be telling - perhaps ISIL (or ISIS or the Islamic State) has designs not just in Syria and Iraq but a strategic vision beyond those two countries? 35. To further confuse the name or label situation, the Grand Mufti of Egypt has advised foreign media to refer to the group as "the Al-Qaida Separatists in Iraq and Syria (QSIS); thus reducing the ability to claim Caliphate status. 37. Islamic State (IS). At the beginning of Ramadan, on Sunday June 29, 2014, the ISIS renamed itself the Islamic State and announced the establishment of the Caliphate. IS Strategy and Tactical Plan for Iraq. The Islamic State is following through on a well-thought out and executed plan developed over the past several years. A lot of ground work was done to ensure that they could provide a sembalance of governance and to ensure political (and religious) obeyance to its rule. The jihadists are using a five-point agenda with which to secure their caliphate. These points include unification of jihadists, a balanced military plan, Sunni councils (similar to the Awakening Councils of Anbar in 2007), appointment of a political leader for jihadists to follow, and the implementation of Shari'a. ISIS (now called the Islamic State) comprises just a part of the Sunni uprising against the Shia-dominated Iraq government. There are many rebellious groups that are currently aligned along side ISIS. 9. These groups include the General Military Council for Iraqi Revolutionaries (GMCIR), Military Council of the Tribal Revolutionaries (MCTR), Military Council of Anbar Tribal Revolutionaries (MCATR), Anbar General Military Council, Tribal Revolutionaries 15., and several other groups. Some of these factions believe in conservative Islamist principles, some are remnants of Saddam's old Baath party apparatus, and some are former Sunni military officers. The area of northeastern Iraq is also referred to as Kurdistan. The Kurds are a significant minority group in Iraq and have a quasi-independent region and limited self-rule. The Kurds also have their own military force known as the Peshmerga. In early August the Islamic State fighters mounted an offensive against the Kurds enjoying some quick success; however, the Peshmerga staged their own offensive retaking some of the lost territory. The Maliki regime has to assume much of the blame for the current strife. It has failed to include the Sunni power brokers or population into the government and has instituted harsh measures against the Sunni population. New Government Needed. The international community has recognized that the current Maliki regime needs to go. Many are pressing Iraq political leaders to replace Maliki. Iran, one of Maliki's prime supporters is reportedly ready to pull the plug as well. If a new government is formed inclusive of the Sunni and Kurd minorities then there is a chance that Iraq can stay together as a nation - instead of fragmenting into three separate independent regions. Iraq is a fragile state composed of three different groups of people - Sunnis, Shias, and Kurds. The boundaries, like many country boundaries in the Middle East, were defined by the European powers during and after the first World War. With the defeat of the Ottoman Empire - new countries were established based on the influence of the English and French; not on the location of different types of peoples and tribes of the Middle East. 2. Had the borders been drawn reflecting the inhabitants then much of the conflict in the Middle East over the past century could have been avoided. It is difficult to figure out who supports who in the Middle East. Some Arab countries support the Iraqi Sunni revolt while others are lined up against it. The many different conflicts and disputes in the area (Israel vs. Palestinians; Egypt vs. Muslim Brotherhood; Syrian conflict; Kurdish moves for independence; Iran influence in the region; etc.) make for a complicated picture. The Guardian provides "A guide to Middle East politics in 2014" that helps clarify the different conflicts and alliances within the region. View the guide. Who Benefits With the Escalation of the Iraq Conflict? Contrary to popular belief, there are a lot of nations in the Middle East that are watching with great interest the success of the Islamic State. One might think that all nations would be adverse to the rise of this extremist group (now an army); but . . . not so much! 29. There are some countries that benefit from the current crisis in Iraq. At one time Turkey benefited from the strife in Syria; however, that has changed now that the Islamic State has risen. 36. Systematic Campaign of Ethnic Cleansing. The Fighters of the Islamic State have been deliberately and systematically forcing ethnic minorities from their homes. These war crimes include mass summary killings and abductions. Many of the worst transgressions took place in the Sinar area. Although the persecution against Christians and the Yazidis have captured the headlines around the world, there are other minorities in Iraq at risk. These groups include Assyrian Christians, Turkmen Shi'a, Shabak Shi'a, and others. Christians Under Threat. The Islamic State group gave Mosul's Christians until midday on Saturday, July 19, 2014 to convert to Islam or face death. Many Christians fled to the Kurdish zone for protection leaving their homes, businesses, and possessions behind. Yazidis Killed and Fleeing IS. The Yazais minority group located in northwestern Iraq (around Sinjar) have fled in the thousands. Hundreds have been killed by the Islamic State fighters. ISIS has been destroying historical and religious sites in the areas under their control at an alarming rate. This destruction is not limited to just Christian and Shia sites but Sunni as well. One of the most noted destroyed structures was the Nabi Yunis (Mosque of the Prophet Jonah) located in Mosul. 11. As of late July 2014 Iraq had virtually separated into three separate states. The Islamic State holds much of the north and west of Iraq, the Shia dominated central government holds the Baghdad area, almost all of the south and much of the eastern area. The Kurds hold a large section of northeastern Iraq to include the disputed city of Kirkuk. The likihood of the Kurd area giving up its newly found independence is very small; it's Peshmerga military formations can hold off the Shia Army and ISIS. The central government has proven that it cannot mount an offensive against the Islamic State in areas with a large percentage of the Sunni population. It is doubtful that the militant army of the Islamic State and its associated allies can take Baghdad and the southern areas of Iraq. The United States is clearly worried about the emergence of the Islamic State within the borders of Iraq and Syria. The response has been slow and deliberate; although there are few good options. A few hundred Special Forces advisors (probably around 300) have been sent to advise and assist the Iraqi military. Apache attack helicopters and drones have been sent to Baghdad International Airport (BIAP) to provide reconnaissance and force protection. A Second Sunni Awakening? Many of the participants of the Sunni Awakening that took place in 2007-2009 defected to the ISIL. The Shia dominated Iraq government arrested many of the Awakening members and did not follow through with promises of reforms, development, government services, and positions in the government once the Sunni tribes helped to defeat the Iraqi insurgents. As a result many of the Sunni tribal leaders are backing the Sunni revolt. However, there are some that are still loyal to the Baghdad government. And once again, there is the possibility that the U.S. may assist in this "Second Sunni Awakening". 17. U.S. Political Opposition to Assisting Iraq. There is not a lot of support to help the Shia dominated Iraq government within the United States. Many just wish that the problem will go away (it won't) and some don't see very many good options to assist the Iraq government and military. Some members of Congress are holding up sales of F-16 fighter jets and Apache attack helicopters 5. as they worry about the weapons falling into the hands of the insurgents and as being a waste of good money. There is consideration for the use of U.S. Army Special Forces units to train, advise, and assist Iraqi Army units. This Combat Foreign Internal Defense (FID) mission is a core competency of Army Special Forces. 1. Advisor Strength and Roles. As of late July 2014 there were about 242 advisors 38. in Iraq performing assessments on the ability of the Iraqi Army to fight the Islamic State. 10.
Insider Threat to U.S. Advisors in Iraq. Advisors sent to Iraq and working with Iraqi Army units are at risk - not only from the Islamic State fighters but from Shia and Sunni members of the Iraqi military and police. 4. The Insider Threat in Afghanistan during the summer and fall of 2012 seriously threatened the coalition forces and prompted a slow down in partnered and advisor operations in the fall of 2012 and drastic force protection measures that reduced the effectiveness of the advisory effort overall. A recent news report 6. states that there are about 825 U.S. troops on the ground in Iraq. Some are working with the U.S. Embassy's Office of Security Cooperation, over 450 are providing security at BIAP (the main airport just southeast of Baghdad) and the U.S. embassy compound in Baghdad, 160 are working in two operations centers (one in Baghdad and one in Irbil), and about 90 advisors are gathering intelligence and conducting assessments on the rapidly evolving situation. The United States conducted a series of limited airstrikes in support of the Kurds against fighters of the Islamic State. Several positions were hit in support of Erbil (the Kurd capital). Air strikes also supported the Kurd counterattack to regain two towns (Gwer and Mahmour) along the "Green Line". 33. In addition, air strikes were conducted to support the Yazidis people stranded on Sinjar Mountain. Humanitarian Assistance. C-17s and C-130s dropped food and water to stranded Yazidis who were atop Sinjar Mountain. Arms and Supplies. The U.S. acknowledged that it was now supplying arms and supplies directely to the Kurds. Previously the U.S. stance was that arms could only come from the Iraq government. This, of course, is a complex and politically charged question. We have a President who takes a cautious approach (if any) to almost all foreign policy issues. Many believe that we should intervene on behalf of the Iraqi government immediately to stop and roll-back the advances of the Islamic State and its other Sunni allies. Others say we should let the situation develop since the authoritarian, sectarian, and incompetent regime of Maliki is not worth fighting for. A recent publication by Anthony H. Cordesman entitled Iraq: A Time to Act published on the website of the Center for Strategic & International Studies (CSIS) provides a very detailed examination of the situation and some very good recommendations on how to proceed. Possible Strategies to Contain or Defeat the Islamic State? There are a number of possible strategies that can be used to try and counter (or defeat) the Islamic State. The range of responses run from "let the Arabs duke it out by themselves" to "lets put U.S. troops on the ground". Learn more about the U.S. strategy for defeating ISIS. Initial Non-Combat Involvment. The United States intially sent in advisors to evaluate the Iraqi armed forces and to conduct and assessment of the situation. In addition, personnel were sent to Baghdad to protect embassy employees. Overflights of military aircraft and unmanned drones took place. Limited Response in Early August. With the Islamic State fighters appearing to be able to inflict reverses upon the Kurds (an unexpected development) and the prospect of a humanitarian disaster (the Yazidis in the Sinjar area) President Obama authorized the limited use of air support by CENTCOM. See more in the United States intervention in 2014 Iraq. Struggle for Iraq: In Maps. BBC News Middle East. 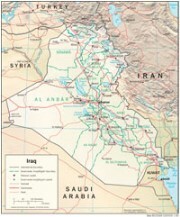 General and Specific Maps of Iraq. Iraq - ISIS Conflict in Maps, Photos and Videos. The New York Times. www.nytimes.com/ . . . the-iraq-isis-conflict-in-maps . . .
1. For more on FID and Special Forces see "Foreign Internal Defense in Iraq", Special Warfare Magazine, January-March 2012 available here. 2. For more on the artificial borders of Iraq read "What We Can Learn From Lawrence of Arabia", Truth Out, June 28, 2014 at this link. 3. For more on the threats against Christians in Iraq see "Under threat, Iraq's Christians flee city of Mosul", Stars and Stripes, July 19, 2014 at this link. 4. For more on the insider threat to advisors in Iraq see "Report: Assessment shows risk to potential US advisers in Iraq", Stars and Stripes, July 14, 2014 at this link. 5. For more on opposition within Congress to helping Iraq see "Democrat threatens to block arms sales to Iraq", The Hill.com, July 24, 2014 at this link. 6. For numbers of U.S. troops in Iraq as of July 2014 see a news article by Military Times dated July 24, 2014 at this link. 7. For more on ethnic cleansing by the Islamic State see a news release by Amnesty International dated September 2, 2014 at this link. 8. For more on recruitment of westerns to the fight by the extremists and the subsequent danger they pose when they return to their homelands in Europe and the United States see Jihadist Sanctuaries in Syria and Iraq: Implications for the United States, Seth G. Jones testimony before U.S. House of Representatives Committee on Homeland Security, July 24, 2014. 9. For a detailed description of the many Sunni groups allied with the Islamic State see A Marriage of Convenience: The Many Faces of Iraq's Sunni Insurgency, by Bashdar Pasho Ismaeel, The Jamestown Foundation, July 25, 2014 at this link. 10. For more on numbers of advisors in late July 14 see "Obama quietly sends more advisors to Iraq", The Hill, July 27, 2014 at this link. 11. See ISIS is destroying both Shia and Sunni shrines and buildings in Mosul, History News Network, July 27, 2014 at this link. 15. Read an in-depth article on the 'Tribal Revolutionaries' - a Sunni tribal confederation allied with the Islamic State - in The doubt inside Iraq's Sunni "revolution", by Ned Parker and Suleiman Al-Khalidi, Thomson Reuters, August 2014 at this link. (PDF). 16. For more on the definition of "Levant" see Wikipedia's page on the Levant. 17. See "U.S. Backs Sunni Plan to Fight Islamic State Jihadists in Iraq", The Wall Street Journal, August 5, 2014 at this link. 22. Iran is now in favor of Iraqi Prime Minister Nouri al-Maliki leaving his position. See "Iran Seeking Successor to Iraqi PM Maliki: Official", The New York Times, August 8, 2014 at this link. 29. For more on those Middle East countries that could possibly benefit from the continuation of the ISIS - Iraq government confrontation see Hoping for Trouble in Iraq, by Jon B. Alterman, Center for Strategic & International Studies (CSIS), June 17, 2014 at this link. See Iraq: The Enemy of My Enemy is Not My Friend, By Anthony H. Cordesman, Center for Strategic & International Studies (CSIS), July 16, 2014 at this link. 30. For more on the five point agenda of the Islamic State see The Islamic State's Strategic and Tactical Plan for Iraq, The Jamestown Foundation, August 8, 2014 at this link. 31. For more on arms to the Kurds see "US Sending Arms to Kurds in Iraq", Associated Press, August 11, 2014 at this link. 32. See "Lost in Translation", Small Wars Journal, August 4, 2014 at this link for more on the significance of the ISIS name. 33. For more on US airstrikes supporting Kurds see "Capitalizing on U.S. Bombing, Kurds Retake Iraqi Towns", The New York Times, August 10, 2014 at this link. 34. For more on the humanitarian airdrops to Yazidis see "Fort Bragg-based soldiers aid in humanitarian airdrops in Iraq", Stars and Stripes, August 10, 2014 at this link. 35. For more on the "name" see "It doesn't matter if you call it ISIS, ISIL or Islamic State, the extremist brand is winning", The Washington Post, August 13, 2014 at this link. 36. For more on Turkey and its relationship with the Islamic State see "In Turkey, a late crackdown on Islamist fighters", The Washington Post, August 12, 2014 at this link. 37. See "Islamic Authority: Extremists no "Islamic State", Associated Press, August 24, 2014 at this link.